This question is geared more toward all of the Smiths and anyone else who would like to voice a response but I figured that Joe and Jim would have some knowledge and insight into it so it is appropriate to ask here. I'm new to this site and noticed there wasn't a thread for the little 41 inch Edge. 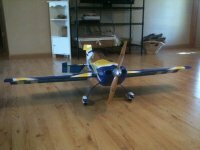 This is such a wonderful little plane and is a great balsa 3d trainer. She really takes a hard harrier landing. A little bit of long term planning. One of my personal goals for 2013 is to try out gas powered models. Now I need to figure out what I need to be drooling over. I'm thinking of a 3DHS 74" Edge with a DLE-30 as an entry level gas plane. Good? Bad? Indifferent? Never taken out of the package. $50 shipped. 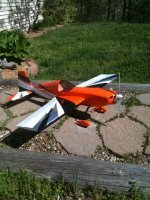 Pshhhhh, it was shameful that this forum had no Velox thread! So here we go. I've read tidbits here and there that you may be designing an airframe for 3DHS. Can you tease us with any details? Size? Scale? Round cowling?